The quadruple system at Pluto: February 15, 2006. Last week, details of discoveries and early interpretation of Pluto's two small moons, formally called S/2005 P1 and S/2005 P2, were published in a pair of papers (Weaver et al. 2006 and Stern et al. 2006) in the scientific journal Nature. Nature is very much the Rolling Stone of the scientific community, and the discovery and interpretation of "P1" and "P2" won the cover of Nature. This is probably as close as the nine of us will ever get to making the cover of Rolling Stone. Although this was my 10th scientific publication in Nature, it was a real rush of accomplishment that vindicated long years of searching the Pluto system for companions to Pluto and Charon. In our two back-to-back papers, we described the orbits and sizes of our two newly discovered moons, discussed the unique architecture of the Pluto satellite system, predicted that similarly complex satellite systems will be found routinely in the Kuiper Belt, predicted that P1 and P2 probably generate ephemeral rings around Pluto, and argued that P1's and P2's orbits argue strongly that they were born in the cataclysmic collision of a large Kuiper Belt object into Pluto that created Charon, billions of years ago. 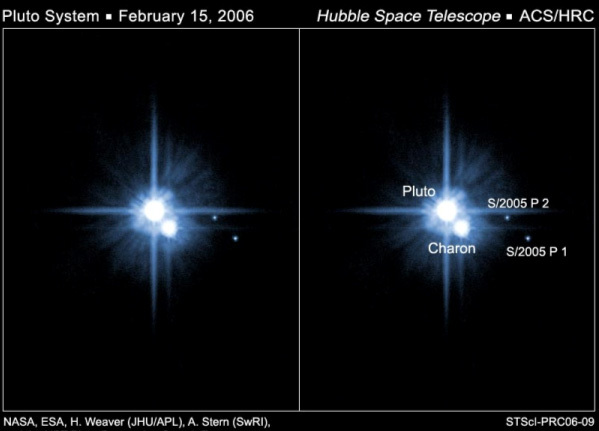 In fact, we believe the presence of P1 and P2 in Charon's orbital plane is very much the discovery that checkmates the 20-year-old hypothesis that Charon was born because of a giant impact onto Pluto. On the same day (Feb. 23) that Nature published our papers and an accompanying "News and Views" piece by New Horizons co-investigator Rick Binzel, the nine of us on the discovery team also published a scientific bulletin called an IAU Circular. This brief communication, edited by Max Mutchler and Andrew Steffl, revealed the results of brand-new Hubble Space Telescope (HST) observations of P1 and P2, made just days before on Feb. 15. The new Hubble images confirm the discovery (see above for an image from this run on HST); the new imagery also shows that our published orbital predictions, made in the fall, were almost bang on. We expect to get one more HST observation on March 2, from which we hope to further refine the orbits of P1 and P2 and obtain the first high-quality color measurements of P1 and P2. You may have also heard that we're working on official names for P1 and P2. We hope to submit those to the International Astronomical Union (IAU) for formal approval this spring. In the meantime, we're referring to the pair as "Boulder" and "Baltimore," in honor of the hometowns of eight of the nine people on the discovery team (and, we note, the respective locations where HST's instruments were built and where HST's scientific institute is located). S/2005 P1, which is the larger moon, is the one we call "Baltimore." S/2005 P2, being smaller, is the one we call "Boulder." And what about New Horizons? Well, it's halfway to the orbit of Mars now, and the flight mission is continuing smoothly. Last week, we conducted the "Launch Plus 35 Day" review of the engineering and operational aspects of the mission. In this formal daylong review, the engineering leads and the operations team presented the status and lessons learned from the first five weeks of flight to a review team consisting of experienced spacecraft engineers and project managers. Although "first light" for each of these three instruments is still in the future, the early tests we performed last week proved that all three instruments survived launch and have good power and command interfaces to the spacecraft. Additionally, each instrument put their microprocessors through various paces, and ALICE unlatched and successfully tested her front door by opening it to space. All of this testing went well and we're very happy with the engineering data returned to Earth by all three instruments. This week, SWAP and SDC will be turned on and tested similarly to the work done last week with ALICE, PEPSSI, and LORRI. In fact, SDC will even begin collecting data, as will PEPSSI. Starting in March, we plan to use SDC, PEPSSI, and SWAP a great deal during the flight to Pluto in order to trace out conditions in the interplanetary environment across the space of 5 billion-plus kilometers from here to the Kuiper Belt. In March, we will continue instrument commissioning with increasingly complex testing of our optical and plasma instruments. Additionally, both copies of our radio science instrument, REX, will receive their initial checkouts in mid-April. Also in March, we'll undertake four very important activities with the New Horizons spacecraft itself. One I've discussed before is a course correction called TCM-3. This roughly 1.2 meter/second trajectory correction maneuver will trim up our course to the Pluto "keyhole" at Jupiter even more precisely than TCM-1A and 1B did. TCM-3 is planned for Thursday, March 9. The other major activities for March are an upload of a few post-launch fixes to our Command and Data Handling (C&DH) software, the checkout of our High Gain Antenna (HGA) and the installation of something called CLTSN. CLTSN stands for Command Loss Timer Safety Net. It's a new feature of the spacecraft's autonomous fault detection and protection system designed to act as a backup ("last ditch") recovery of the mission if the spacecraft determines it has failed to hear from the ground controllers for too long a time (about 135 days). If this unlikely happenstance ever occurs, autonomy's CLTSN switches the entire spacecraft avionics chain to the backup side, turns the spacecraft back to a good communications attitude with the HGA dish pointed toward Earth, sets the downlink beacon to "Red 6" and fires up the receivers to await new instructions from Earth. CLTSN, which we colloquially call the "catcher's mitt," is a new layer of autonomous spacecraft recovery smarts designed to take over if the normal autonomous fault detection and recovery procedures have failed to recover the mission. This is something I insisted on seeing added to the mission before I signed off on launch. I hope we never have to use CLTSN, because it'll mean we're down to the last play in our playbook. But I do think it's an important new capability. After all, without CLTSN, we wouldn't have a last-ditch recovery to take over if some "unknown, unknown" prevented the normal recovery processes from working as expected. Well, you can see the next few weeks are going to be busy for New Horizons. 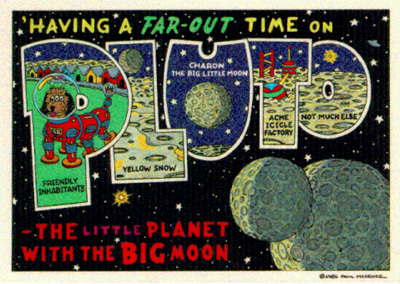 Pluto, Charon, Boulder, and Baltimore lie ahead. 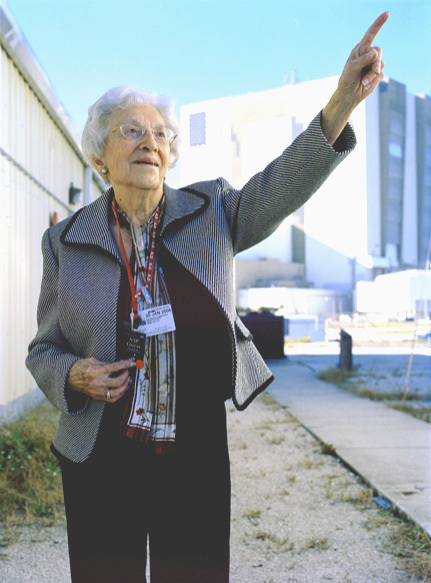 Patsy Tombaugh, widow of Pluto discoverer Clyde Tombaugh, points to the Pluto system on Jan. 19, 2006.